This year I decided that Grant needed to start "understanding" Halloween. 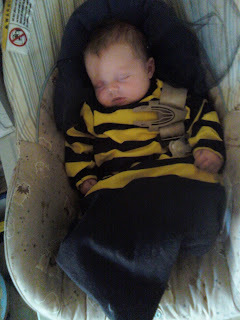 Last year he was only 1, and sick, so I didn't do anything more than dress him up to take pictures. I started thinking about costumes early, and found a deal on ebay! I bought both Grant and Cami's costumes for next to nothing!! 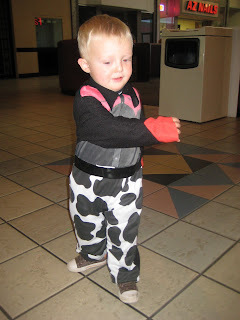 I was worried how Grant would look in the cowboy outfit, but he pulled it off... And was extremely cute (though he didn't know how to work his gun!). Mark and I figured we would spend the night with his family. 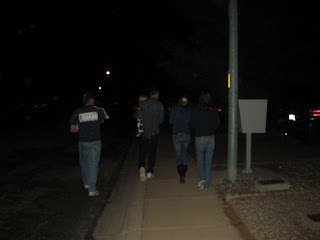 We had a great dinner, and then it was time to go trick or treating!! The pictures are not the best, but the give you an idea on how well protected Grant was. Mark and I laughed at his "gang". Papa Maroney, Aunt Shelby, Aunt Morgan, mom and dad all went with him. 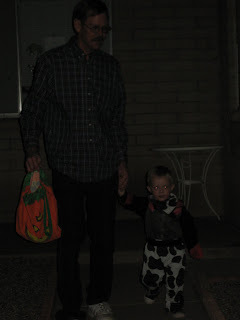 Papa Maroney helped Grant trick or treat. Grant was so funny, and did things that only a two year old could get away with. People would give him a piece of candy, and he would stick his hand in the bowl for more... They thought it was cute, I was a little embarrassed... But hey, he's only 2!! And of course here is the only picture I have of Cami. After a few houses, she went back to Grandma's to hang out there!! I had a lot of fun watching Grant this year, I can't believe how big he is getting!! I have been waiting for this...Grant is a such a cute cowboy! It's such fun when your kids start to "get it" isn't it?!! Glad you had a fun Halloween. Can you send me you snail mail address to chart@utwire.net? I'd sure appreciate it!